By Angela Doland . Published on November 16, 2017. Welcome to Ad Age's Wake-Up Call, our daily roundup of advertising, marketing, media and digital-related news. You can now get an audio version of this briefing on your Alexa device. Click here, or search for "Ad Age" under "Skills" in the Alexa app. What people are talking about today: The Koch brothers -- the billionaire industrialists and champions of conservative causes – are reportedly offering financial support to Meredith Corp.'s bid for Time Inc. The New York Times, citing unnamed people involved in the talks, says Charles and David Koch "have tentatively agreed to back Meredith's offer with an equity injection of more than $500 million." Meredith, whose titles include Better Homes and Gardens as well as Family Circle, has tried before to take over Time Inc., which publishes Time, People, Fortune and Sports Illustrated. But this time Meredith is reportedly back with big money. The Times notes that the Kochs spent $720 million ahead of last year's election to support conservative policies and candidates, adding that it's not clear how much influence (if any) the brothers would have on the publications if the deal happens. But if it does go forward, every word from the legacy publishing empire will be scrutinized for potential signs of the Kochs pressuring coverage. Incidentally, here's a Bloomberg News headline about the Kochs' influence, from a few hours before the Times published its scoop: "Koch-Funded Group Prods Trump's EPA to Say Climate Change Not a Risk." These are interesting times. Last month, Procter & Gamble claimed victory in its battle to stave off activist investor Nelson Peltz. But now a recount of shareholder votes suggests Peltz actually won a seat on the board, by a very slim margin. Ad Age's Jack Neff says the whole affair is "reminiscent of the hanging chads of Florida." P&G and Peltz have fought for months about the best way forward for the world's largest ad spender. Peltz wants P&G to reorganize into three units, hire more outside execs and acquire more startup or emerging brands. P&G says the results are "subject to a review and challenge period," so this isn't over yet. Also: News of the recount came in soon after Procter & Gamble Chief Brand Officer Marc Pritchard spoke at the Ad Age Next conference. Watch a clip from his interview with Jack Neff here. The ongoing battle between WPP and Japanese agency company Asatsu-DK just took another twist. Bain Capital made a $1.35 billion bid for ADK, and ADK wants the deal to happen. But several big ADK shareholders including WPP, which owns nearly 25 percent of the Japanese agency group, say Bain's offer is too low. Now WPP says it's willing to raise its stake to 33 percent if the deal with Bain fails. Stay tuned. What are the 10 most valuable brands in the U.S.? A new list from WPP and Kantar Millward Brown's BrandZ says the list is topped by Google, Apple, Amazon … and at No. 10, Marlboro. As Ad Age points out, that's surprising, given that cigarette brands have not been allowed to advertise on TV or radio in the U.S. since 1971. And it also means that the Marlboro is ahead of Coca-Cola, Starbucks and Nike. Hmmm. Some among us are skeptical about brand ranking lists and their methodologies; so be it. But here's one possible clue about this one: BrandZ says one of its metrics, Brand Contribution, "looks specifically at how well a brand differentiates itself, generates desire and cultivates loyalty." Desire – or addiction? What to watch: Today is the second day of the Ad Age Next conference in New York. On Wednesday, IBM's Chief Digital Officer Bob Lord talked about why you shouldn't fear AI. (Watch a clip of his interview with Ad Age's Lindsay Stein here.) Procter & Gamble's chief brand officer, Marc Pritchard, talked with Ad Age's Jack Neff about where things stand with his digital ultimatum. And watch Doug Robinson, founder and CEO of FreshDigitalGroup, speak to Ad Age's Megan Graham about why brands need to take voice assistants seriously. Not just a U.S. problem: Researchers at the University of Edinburgh say Twitter accounts from a Russia-based troll farm tried to create discord in the UK over the Brexit vote, The Guardian reports. Ta ta: The Weinstein Company, facing "the looming prospect of bankruptcy," sold the rights to "Paddington 2" to Warner Bros., The Hollywood Reporter says. Bundling: Reuters, citing unnamed sources, says "Amazon.com has scrapped plans to launch an online streaming service bundling popular U.S. broadcast and cable networks because it believes it cannot make enough money on such a service." The source is "people familiar with the matter." Iconic: Mary Ellen Matthews, the lead photographer for "Saturday Night Live," once took a photo of Jim Carrey hailing a cab with a llama. 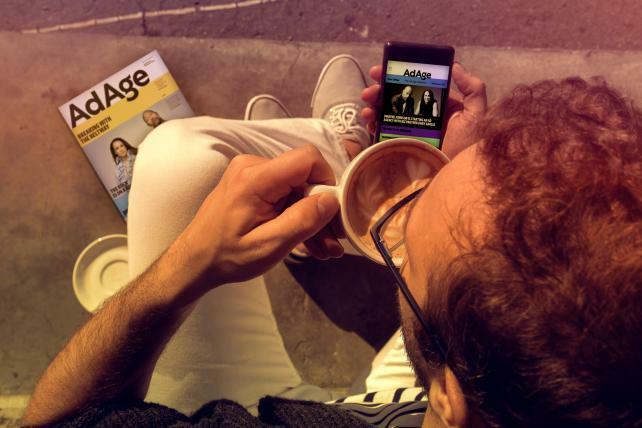 Read a Q&A between Matthews and Ad Age's Jeanine Poggi. Creativity pick: Delta now lets you send texts from the air, and it's got a funny campaign from Wieden+Kennedy New York showing upside-down people texting "from above." It's kind of hard to put into words, so just watch here, and read more by Alexandra Jardine.